The hotel is situated right on the beach,about 500 meters away from the centre of the Sunny Beach resort. A splendid view to the whole bay reveals even from each room of the hotel.The hotel location is attractive not only for family couples but also for young people.It is quiet and calm and at the same time not far from the entertainment facilities. The 14-floor hotel consists of 156 rooms.All the rooms at the Europa Beach Hotel have a sea-side view and are equipped with private bathroom with shower and WC,EB,air-condition,telephone,radio,fridge(with charge) and satellite TV and a balcony or terrace.The family rooms comprise 2 interconnecting rooms. 7 overnights, sharing standard double room. Sunny Beach is the largest resort in Bulgaria. It is situated on a bay in the shape of a crescent between the town of Nesebar and the resort Sveti Vlas. With its hundreds of hotels, multiple entertainment and catering establishments, shops and its developed infrastructure, the resort complex can presently receive thousands of tourists. The climate here is distinguished by hot summer and average July temperatures of 22-23° С. The beach line is over 10 km in length and in some places it is more than 60 meters wide. The fine sand, the natural sand dunes and the gradually deepening sea bottom attract thousands of tourists. 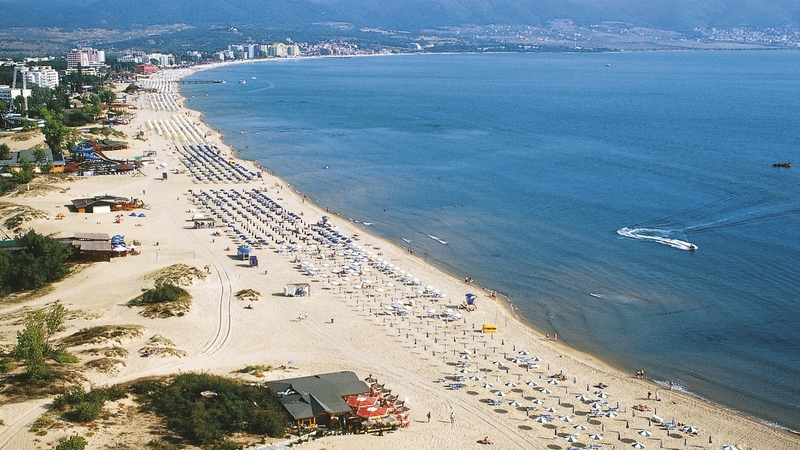 The beach of Sunny Beach is the holder of the Blue Flag prize sınce 2011 – a distinction of a clean environment. The accommodation options in the complex are exceptionally diverse – there are luxurious five star complexes here, as well as various categories of hotels, villas, guest houses, apartment hotels, etc. The catering and entertainment establishments in the resort are numbering in the hundreds and offer diverse Bulgarian and international cuisine. The clubs and discotheques of Sunny Beach are famous wıth parties attractıng many young people. Entertainment of tourists is guaranteed by diverse attractions – water sports, surfing, beach volleyball, aqua park, bowling, various installations for children, etc. The town of Nesebar is situated in close proximity. Due to its multiple cultural monuments it is included in the UNESCO list of cultural inheritance sites. The largest yacht port on the Bulgarian Black Sea shore is situated in the nearby resort of Sveti Vlas.